The month of January brought a flood of iOS-accessory announcements, starting with CES and continuing through last week's Macworld | iWorld show. But there are still new accessories for your iPhone, iPad, or iPod touch that have been announced but that we haven't yet covered. Here's what the past week has brought. Brother: One nifty thing about iOS devices is that you can print directly from them, wirelessly, using Apple's AirPrint technology. But less nifty is that not all printers are equipped with AirPrint. So iPhone and iPad users will be glad to discover that Brother International has launched an entire line of AirPrint-enabled color inkjet printers. Models in the line include the MFC-J280w, MFC-J430w, MFC-J625dw, MFC-J825dw, and MFC-J5910dw, ranging in price from $100 to $200. Helo: New company Helo has unveiled its signature product, the $20 TabletStrap 360. It's a strap that wraps around two cater-cornered ends of your iPad, providing a hand strap that can be used to hold the iPad in an ergonomically comfortable position. The strap comes in five colors: black, red, blue, orange, or green. Juicebox: A group of former bartenders got together to create the Juicebox, which is a sort of combination of a charger and a safe, used to store and power up your iPhone when you're out on the town. The device, which is being pitched to bars and restaurants, contains seven small steel chambers, each containing power cables. The customer swipes their credit card to gain access to a chamber, plugs in their phone, then partakes in the libations while their phone charges. The company doesn't list the price of the Juicebox; you'll have to inquire directly. Kidz Gear: Children love iPhones and iPads, but you've got to protect their developing ears. That's why Kidz Gear has created its $30 Kidz Gear Volume Limit Headphones, made specifically for Apple's mobile devices. The over-the-ear headphones are designed for children 2 years and older, and come with technology that limits the maximum volume of music and other audio. 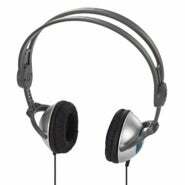 Like many adult headphones, this set includes an inline remote and microphone. The company says that despite the volume limiting, the Volume Limit Headphones provides high-definition sound quality. Scosche: Sometimes you're in your car and you need to power both your iPhone and your iPad—or even two iPads. Scosche's $20 ReVolt c2 charger plugs into your car's accessory outlet and provides two USB ports for powering up your iOS devices—or any other electronic gadgets that can be charged via USB. Each port supplies 10 watts of power, making it the only car charger we've seen that can handle two iPads at the same time. Qmadix: January was a busy month for this accessory provider. After unveiling a host of products at CES, Qmadix went to Macworld | iWorld and unveiled its Ecoustic "eco-friendly" charging and sync cable. 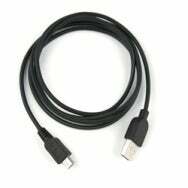 The four-foot long cable's cover is made from a combination of biodegradable materials, and includes a 30-pin dock-connector adapter for compatibility with iOS devices. The Ecoustic hits the market on April 2.